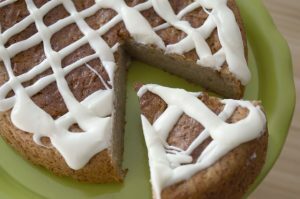 A delicious snacking cake with cinnamon and vanilla in the batter. 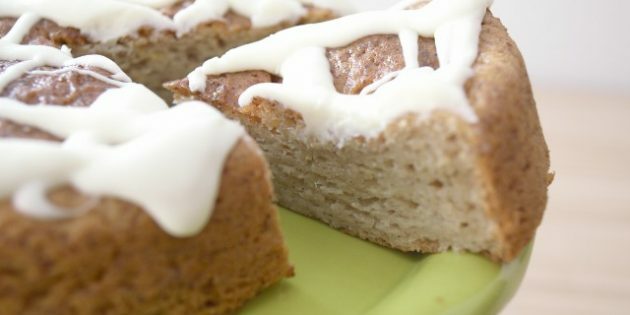 Topped with a cream cheese drizzle, it’s perfect with a hot cup of coffee or tea. Makes just enough to enjoy. Need something special for the holidays or guests that are coming? Make this ahead of time and freeze for up to 6 weeks. Be sure to wrap well to prevent freezer burn. Just leave in the refrigerator the night before and it will be ready for you the next morning. Line an 8″ round cake pan with parchment paper. Grease the sides and set aside. In a small bowl,stir together the milk, vinegar and vanilla. Let sit for 5 minutes. In a medium sized bowl, whisk together the flour, baking powder, baking soda, xanthan gum ( if using) , salt and cinnamon. In a large bowl, beat the butter until fluffy. Slowly beat in the sugar until light and fluffy. Add the eggs and whites one at a time beating them in completely before adding the next one. Stir in the 1/3 of the flour mixture, then mix in 1/3 of the milk. Repeat this two more times until all the flour and milk has been added in. Spoon into the cake pan and let it sit on the counter for 30 minutes. When the time is almost up, preheat the oven to 350 degrees. Slide the cake in and bake for about 18 minutes and cover with a piece of aluminum foil draped lightly over the top. Bake for another 8 to 12 minutes or until a toothpick inserted in the center comes out clean. Take out of the oven and let cool in the pan for 5 minutes. Run a very thin spatula around the inside edge of the cake and flip out onto a cooling rack. Let it cool completely. Either make the drizzle and frost the cake or wrap the cake tightly in freezer wrap and freeze for up to 6 weeks. Melt the butter ( in a medium sized bowl) in the microwave. Let it sit for a couple of minutes to cool down, then add the cream cheese and beat until mixed. Slowly add the confectioners ( powdered) sugar and the vanilla. Add the milk, one tablespoon at a time, until the drizzle is the consistency you want. Just pourable enough but not too thin. Using a spoon, drizzle the frosting on top of the cooled cake. Makes one 8″ round cake. Enough for 8 servings. Cut the cake in half with a long serrated knife. Spread frosting between the layers and the top and sides. You can also fill this with jam and then frost. You can also change out the flavoring by using almond extract or strawberry or hazelnut or anything else you may have. This recipe is pretty versatile. Make cupcakes by spooning the batter into paper lined tins. Makes about 12. I hope you enjoy this amazing cake as much as I did.